Each week explores questions asked of Jesus during His time on earth; questions coming from both Pharisees and His disciples who couldn’t understand why He lived the way He did. Does our life beckon questions from both sinners and saints. As Christ-followers, our missional living ought to always include evangelism, but our evangelism must be preceded by missional living. Category: Everything We Make Tags: Forgiveness, love, Matthew, missional living, Proverbs, question, Relationships, understanding, why? 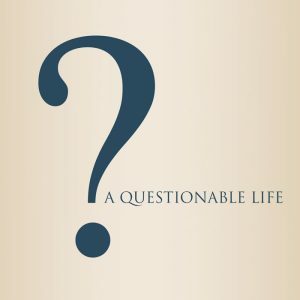 Series Big Idea: Live your life in such a way it causes people to question why…and then tell them. Big Idea: Are we living our lives in such a way it causes both sinners and saints to ask “Why?” As we fully live out our faith in Jesus, we are challenged to both live missionally and then, when asked, share why we live the way we do. Big Idea: How we respond to injustice reveals our Christ-likeness perhaps more than anything else. Big Idea: The people we engage with, as well as those we avoid and judge, reveal a great deal about our hearts condition. This week we’ll be challenged to build relationships with the same kind of people Jesus engaged. Be the first to review “A Questionable Life – Everything We Make” Click here to cancel reply.